This column is a weekly Marvel column. But that doesn’t mean it exists in a vacuum of the MCU (nor, for that matter, does my movie consumption). If push came to shove, I’d choose Marvel over DC any day of the week and twice on Sunday. But I still appreciate what DC offers currently and historically—across comics, movies, and television. I’ve admitted that The Dark Knight is one of my favorite comic-book movies, and I consider its version of the Joker to be the most impressive incarnation of a comic-book supervillain thus far in movie history. This is all to say, I try not to let my Marvel fandom cloud my ability to engage in objective critique. And I don’t think others should either. People enjoy the media they enjoy—we should be cautious when we judge their opinions. The temptation to revert to Marvel vs. DC rhetoric with each and every piece of movie news that comes out is, I think, net harmful to comic-book movies as a whole. That being the case, despite my honest desire for Batman v. Superman: Dawn of Justice to be a megahit, I must confess I was underwhelmed by the trailer drop last week. Maybe my expectations were too high; I considered the comic-con version of the Batman v. Superman trailer to be one of the best this year. But for anyone who follows my twitter (shameless plug even though I don’t tweet as much as I should), they would have seen a swift and averse reaction to this new trailer. This negatives response was mirrored by many others, both DC fans and non-fans alike. In fact, when watching the trailer for the first time, I actually had to stop it at multiple points to take in the surprise at what I was seeing. As much as I hate direct and constant Marvel to DC comparisons, I do think this is a prime occasion to look at what I think the Batman v. Superman trailer got wrong that the Civil War trailer happened to get right. The first and most dramatic difference between the two was a sense of focus and tightly woven narrative. As I wrote in my initial review of the Civil War trailer, it left the audience with an unequivocal sense of the movie’s focus: Captain America. We saw more or less a continuation of the storyline of Captain America: Winter Soldier. Cap’s relationship with Bucky was front and center, brought to the fore by virtue of an ideological battle over the Sokovia Accords. You see other supporting cast-members in the background—the Scarlet Witch, Hawkeye, Black Widow—but they don’t distract. Black Panther, a new character, is introduced without jarring effect. It was remarkably well crafted. Coming off of the latest Batman v. Superman trailer, what’s the focus? Batman? Superman? Batman and Superman fighting? The introduction of the Trinity? The introduction of the Justice League? Doomsday? It was haphazard at best. The reason the comic-con version of the Batman v. Superman trailer was so successful and so powerful was its linear focus on the fight between Batman and Superman, combined with a brief, enticing cameo from Wonder Woman. It set the stage for one of the most epic showdowns in comic-book movie history, and didn’t let its attention waver. The same cannot be said for this trailer. It is looking increasingly like this should actually be two movies—a “Batman vs. Superman” movie and a separate “Dawn of Justice” movie. Mashing both together, one gets the sense of a slipshod kitchen-sink narrative. The Civil War trailer was also tonally consistent. Marvel has been criticized for its overabundance of quips, and rightly so. But the Civil War trailer, as I noted, had a grand total of one quip. It didn’t try to be both quippy and serious. This is in keeping with Marvel’s tendency to have dark, brooding teaser trailers, and might not be emblematic of the final movie as a whole (though I hope it goes more of the Winter Soldier serious route). But the consistency of the tone helped to build anticipation and lay the stakes for the Civil War struggle. The tone matched its subject matter and the emotional depth of two great friends, Steve Rogers and Tony Stark, coming to blows with each other. The Batman vs. Superman: Dawn of Justice trailer, in comparison, almost couldn’t decide what kind of tone it wanted. The beginning of the trailer was the best part—you had excellent and captivating repartee between Bruce Wayne and Clark Kent, only to have it dissonantly interrupted by a clownish Lex Luthor. The “Is she with you?” comment at the end of the trailer has been much derided as well, and rightfully so. This is the first time in cinematic history you have the epic Trinity assembled, only to have a trite wisecrack that woefully fails to mirror the scope of the subject matter it comments on. The trailer, as a whole, jumped back and forth between serious and silly in a way that didn’t produce a stellar result. To say I’m disappointed with the Batman vs. Superman: Dawn of Justice trailer puts it lightly. I’ll still go see the movie—any fans of comic-book movies who says they won’t are kidding themselves. But my expectations have been lowered. Most importantly, I’m not celebrating this misstep of the DCEU, and I call on my fellow Marvel fans not to do so either. 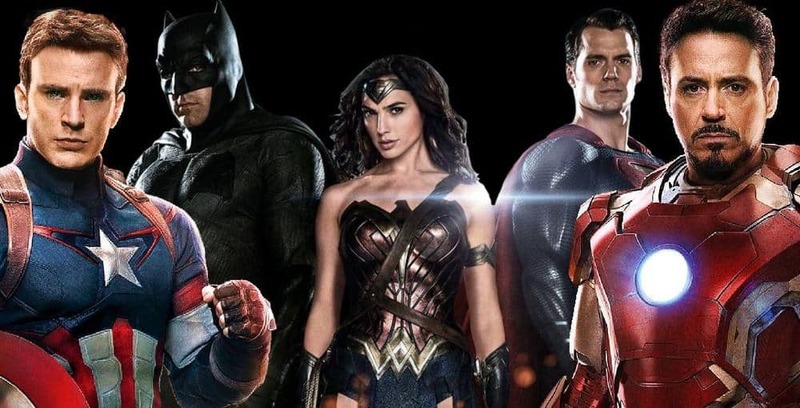 If Marvel and DC both make good movies, that’s good for everyone. That means comic-book movies succeed, and this superhero bubble we’re all currently reveling in lasts all the longer. We should hope for that and celebrate it if it occurs. This latest trailer isn’t a good indication.